Oil Color: Old highlighter yellow. ITI: It’s decidedly resinous while at the same time being huskily fruity and clearly sharp floral (from the muguet and carnation). Wet: Oh no! My first impression is of long-dried car air freshener, which is what often happens when strong white florals (lily, jasmine at times) react with my skin. There is still that sense of huskiness to it, but it isn’t enough to overpower that air-freshener impression. Dry: Well, now that is a shifter. Now that it has been on my skin for 5 hours, the scent is a creamy white floral with deliciously alluring undertones of podium and benzoin. This is so much better now that it has had a chance to dry. Wings of a great wind. Ah the singing, ah the delight, the passion! While the tenth sang wonderful things they knew not. Shone a light of fire as a crown for ever. Paused, and almost wept; such a song was that song. Clothed with the wind’s wings. Yea, the gods waxed pale; such a song was that song. Full of fruitless women and music only. Oil Color: A vibrant apricot color. Bottle Design and Artwork: This is a standard 1/32 ml imp that has been decanted by Mystery213. The back of the label has the scent notes and the decanting information. The label features the label art that would have appeared on the bottle on front. The image name is in thick, bold white letters just above the thinner and smaller font of the company’s name. The image art is of who women, one reclining while the other holds her sweetly and kisses her. ITI: Gauzy muguet floats effortlessly from the imp, trailed by the balsam and a hint of ephemeral sweetness from the grey amber. Very feminine and clean. Wet: The amber is much stronger and warmer on my skin, while the muguet (lily of the valley) is still just as light and delicious on my skin as it is in the imp. The tolu balsam rises from a background note to more of a middle, serving as a contrast to the delicate floral note while anchoring the resin in the more woody rather than oriental realm. There is a subtle waft of myrrh every now and again, although it isn’t too strong. Dry: Well, hello there, tonka. About 5 minutes into the dry-down, the delicious warmth from this note begins to bloom against the delicately gauzy muguet. Oakmoss has also decided to make an appearance, which adds some soft earthiness of the floral and resin notes. After a few more hours, I am left with a gorgeous grey amber, myrrh, and hints of subtle, white floral with a touch of earthiness. Oil Color: Highlighter yellow oil. Bottle Design and Artwork: This is a standard vial / imp size (1/32 oz). The label wrapped around the bottle features an Art-Deco inspired phoenix with name of the company next to the phoenix. 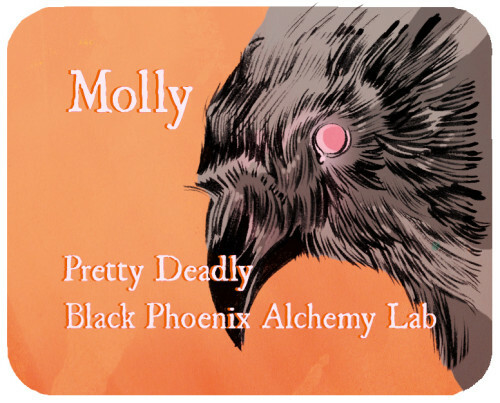 On the other side, the title of the scent written in large, clear black font outlined with red on the front. This is an imp I received directly from Beth and Black Phoenix Alchemy Lab. ITI: Strongly proud, clean white floral push their way out of the imp. Sharpness and something faintly floral dwells just under the white florals. It’s decent so far. Wet: For some reason, I’m detecting white jasmine and lily of the valley, perhaps some ylang ylang as well. There’s a touch of powder on me, so there’s possibly a light musk thrown in the mix. It certainly has lots of throw. My friend could smell it three rooms away. Dry: This scent lingers for a good period of time. 7 hours and it’s still producing a good amount of throw. The white florals, jasmine, and soapiness still remain, but it is clean and I have had a touch more luck wearing it. 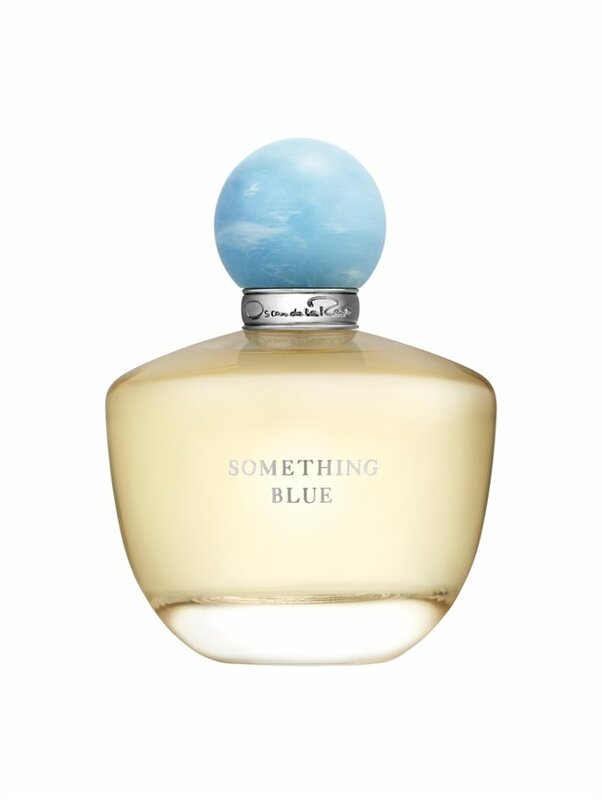 Discover Something Blue, a fragrance to cherish forever. Inspired by life’s most magical moments, this romantic fragrance opens with a sparkling burst of mandarin and linden blossom and warms to an irresistibly sultry finish with notes of bourbon vanilla and white musk. A removable ring engraved with the designer’s signature logo is a symbol of Mr. de la Renta’s abiding devotion to his beloved clientele. From this day forward. Bottle Design and Artwork: This is standard 1.5 ml clear glass vial with a robin’s egg blue applicator cap. The vial has silver, lower-case, Italic font displaying the name of the designer. The name of the scent is in small block font above it in the same filler color. The only other marking is “004” on the vial. ITV: “Something Blue” is a very light and clean scent with tones of green and citrus under white florals. It reminds me of a crisp garden party just after a fresh rain. Wet: The green here is a bit bitter, but it’s somewhat balanced by the narcissus, stephanotis, musk, linden blossoms, and cashmere wood. However, I don’t get any of the warmth from the vanilla bourbon or ambergris that the notes normally provide, which would have been nice. Dry: I’m a bit disappointed as the scent fades to only a papery, slightly watery (lily of the valley) ghost of its former glory and only after two hours and a brisk walk. I wish this had more staying power, but I’m not willing to shell out money for something that vanishes so quickly. Bottle Design and Artwork: This is a standard vial / imp size (1/32 oz). The label wrapped around the bottle features an Art-Deco inspired phoenix with the name of the company next to the phoenix. On the other side, the title of the scent written in large, clear black font outlined with red on the front. ITI: Strong and imperious stephanotis flanked by lily of the valley, calla lily, and almost medicinal cherry. This is royal, indeed. Wet: The cherry is a bit nice once on the skin, while the floral notes take on a touch of green underneath their imperious white and regal qualities, although the stephanotis still runs the show. It’s nice, but a bit too overtly floral and strong for my taste. Dry: I’m left with a faintly dusky combination of lily of the valley and stephanotis with a hint of sweetness from the cherry, but it’s very close to the skin and I have to concentrate to pick up anything after just 7 hours. ITI: This reminds me of the dessert at midnight for some reason. I think part of that is the oudh and saffron along with the cedar. It’s relaxing in a way, like being alone. Wet: Yes, I do like this. It’s well balanced, intriguing, without being overbearing. The lime has now come out to balance the honey and cedar, which I can now smell. The tobacco, amber, and saffron twin lusciously underneath, making the scent cool, distanced, yet intensely exotic. Dry: I’m still very much still in love with it, even when dry. IT has this lovely dusky, resinous quality that has been sweetened slightly by the tobacco and honey, but that all has been tempered by a subtle woodsiness from the cedar with a slightly smoky leather from the nagarmotha, which is a native Indian species also known as Cypriol when distilled into an essential oil. Oil Color: A gorgeous mix of orange and watermelon Jolly Rangers colored oil. ITI: The lily of the valley is very strong, almost bordering on the strength of jasmine notes for me, but at least I can smell the gentle purple lilac poking through set against the dragon’s blood resin and galbanum. It’s a much more floral version of the Ars Draconis when compared to the others I have tested. Wet: The florals are still dominant on my skin, which makes the scent as a whole take on a Glade, artificial quality on my skin for some reason. 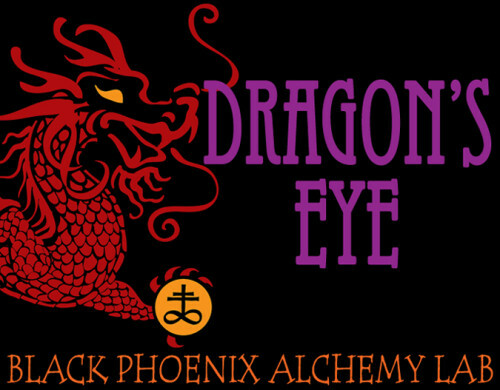 In fact, the dragon’s blood is really quite subtle, and I think that greater dominance would help the allure of the scent overall. Dry: after a full 12 hours, the scent is still noticeable – composed of light lilac and a much more well behaved lily with a touch of resin for depth. I enjoy this much, much more dried. Scent Description and Notes: “Capturing the spirit of women, the Chloé vision is not about one singular woman, but rather about the rich and varied personalities of all Chloé women. This fresh, smooth floral fragrance evokes sublime powdery rose. The effect is chic, comfortable, and entirely addictive. Top notes of pink peony, freesia, and lychee embody subtle freshness. At the heart, midnotes of magnolia flower, lily of the valley, and rose rise to sublimated femininity. A base of velvety elegance comes to fruition through cedarwood, amber, and honey. Inspired by the details in Chloé’s fashion, the flacon’s heavy but softly curved and grooved glass reflects femininity and strength. 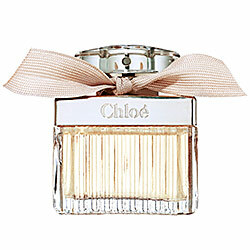 The plated-silver top is embossed with the Chloé mark and adorned with a hand-tied ribbon. Bottle Design and Artwork: This is a standard 1.5ml sample vial. The vial is a clear glass, a plastic nozzle, and black writing (font varies in size) featuring the brand and scent name along with the amount, and production information. ITV: I spritz this and I immediately wanted to smell more. It’s lightly floral, sparkling, innocent, and deliciously fruity (luscious and ripe). Wow! Wet: It’s mostly floral on first spritz – magnolia, lily, delicate rose, and peony. As it settles, I get a little warmth from the amber, and a touch of fruitiness, but they aren’t as strong on my skin as I had hoped. Dry: I’m disappointed that this doesn’t have more staying power. Only a few hours later and it’s skin-close and only lightly perceptible. As it stands, it’s light powder (amber/honey), and sweet floral. Oil Color: A nice darkened marmalade color. ITI: Yep, that’s jasmine and that is all I get. Wow. Wet: I tried this on earlier but didn’t have time to sit down and write anything. I remember thinking that I smelled…strongly perfume-y, which is the jasmine. Normally, I like the other notes, but jasmine is just a bully on my skin. Dry: Slightly powdery jasmine, a touch of rose, and lily. It’s too overtly floral for me, so it’s a pass. Scent Description and Notes: “ The Queen of Sheba, half-demon, they said, on her father’s side, witch woman, wise woman, and queen, who ruled Sheba when Sheba was the richest land there ever was, when its spices and its gems and scented woods were taken by boat and camel-back to the corners of the earth, who was worshiped even when she was alive, worshiped as a living goddess by the wisest of kings, stands on the sidewalk of Sunset Boulevard at 2:00 A.M. staring blankly out at traffic like a slutty plastic bride on a black-and-neon wedding cake. She stands as if she owns the sidewalk and the night that surrounds her. Oil Color: A lightly burnished yellow copper oil. Bottle Design and Artwork: This is a standard vial / imp size (1/32 oz). The label wrapped around the bottle features the name of the scent in black block letters outlined in red. The name of the overarching collection (Neil Gaiman) is above the scent in small, black block font. On the bottom is the for supporting the Comic Book Legal Defense Fund. The back features the customary Phoenix and information. ITI: I get ambrette seed, musk, slightly Honey Bucket honey, and touches of fig and apple. Wet: The musk and almond with the honey give off a warm and pleasant impression, like walking into a home when someone is doing his or her holiday baking. I can also still pick up with fig and faint apple. I’m surprised the honey is behaving as well as it is right now on my skin. Dry: I get honey, apple, lily of the valley (which make this a little more complex), musk, and fig. It’s much, much better than I had anticipated when I smelled it in the imp. Scent Description and Notes: The Sanctus are considered by some pious vampires to be the saints of their kind, and from what we have gleaned, they are very likely the stuff of myth. These vampires are paragons that possess impossible, phenomenal powers that defy known physics, including the ability to shift shape, turn into a gaseous form, and command other vampires through will alone. The mythological Sanctus are venerated by some, but we have no evidence whatsoever that they truly exist. Bottle Design and Artwork: This is a 5ml standard brown apothecary bottle. The label extends just under halfway around the bottom. The label features the name of the collection retooled as “Homo Strictus” along top and the name of the company along the bottom in the same, but skinnier and smaller font red block font against black text fields. Both are in a bright fuchsia-pink text field. The name of the scent is in lovely white italic and cursive font in white. The image is a male vampire clad in a cloak set against a bat-filled and full-moon laden sky. ITB: It’s sweetly floral. The osmanthus and musk temper the lily of the valley, for which I’m thankful. Wet: It reminds me of a designer perfume a little. If you crossed Burberry Brit with Sugar’s Fresh Lemon, you would have this scent. It’s a fresh, bright floral with citrus for some reason and just a hint of resin. It’s rather beautiful, actually. Dry: It’s now powdery and resinous from the frankincense and osmanthus. There is a faint floral, but I wish it were stronger. I like this much better wet, although it isn’t bad now dried. Bottle Design and Artwork: This is a standard 5ml brown apothecary bottle. The label extends just under halfway around the bottom. The label features the name of the company along with the phrase “hand blended perfume oil” framing the BPAL symbol along the bottom. The name of the scent takes up the largest portion of the label in tall block fond. All of this is set against a parchment colored background and framed by an ornate iron-work border. In the Bottle (ITB): It’s resinous but strongly green and herbal with a faint impression of floral behind everything. Wet:The opopponax is rather smoky and it significantly impacts the lily of the valley, taking it from a pure floral to something dark and foreboding. Dry: Smoky opopponax that skews tobacco and now the lily of the valley is warping to a jasmine-like smell. Odd. Oil Color: A colorless oil. Bottle Design and Artwork: This is a standard vial / imp size (1/32 oz). This is a decant from Absinthetics. On the back, she has the notes of the scent, the title of the scent in orange, the company acronym in bold, and her decanting information. The image on the front label is a detailed ink drawing of what reminds me of Mary, but multiple swords seem to be driven into her heard while he prays, adorned in gorgeously detailed vestments. Above her head and crown, a black flame hovers. ITI: It smells like bright florals and cat litter. I’m not a fan. Wet: Holy lily and heady floral! It’s a bit much for me and starts giving me a headache. Dry: After a while, I get lilac, musk, and faint osmanthus. It’s much better behaved while dried. This one had a few notes that I like very much. I hope it works on me. Above the sea of Wails. From the tree of Memory. Oil Color:Fired orange-y red. It’s a gorgeous oil color! Bottle Design and Artwork: This is a standard vial / imp size (1/32 oz). This is a decant from ralenth. On the back, she has the notes of the scent in large, cursive font. On the side, she has her decanting name, while the front features the name of the collection and the name of the scent framing the image, which is of a male and female ghost with at winds framing a heart between them. ITI: It’s floral and green with a little juiciness. I get tobacco flower, tea rose, magnolia, oudh, and carnation. It is a clean scent, especially along the lines of Linen. Wet: Juicy, floral, and slightly soapy. Tea rose, carnation, magnolia, lilt, and subtle hints of sandalwood. Very nice. Dry: Carnation, magnolia, with heavy whiffs of tea rose. The incense aspects of it has died down considerably. Other Impressions: This is a scent worth keeping. It reminds of of a combination of The Body Shop’s Dewberry and Estee Lauder’s Linen. Oil Color: A dried and backed orange rind color. Bottle Design and Artwork: This is a standard vial / imp size (1/32 oz). This is a decant from ralenth. On the back, she has the notes of the scent in large, cursive font. On the side, she has her decanting name, while the front features the name of the collection and the name of the scent framing the image. The image is a painting of Renaissance styled saints praying together. ITI: This reminds me of mass incense set among a bed of gardenias. It’s rather dreamy. Wet: Innocent gardenia paired with rose and lily. A touch of myrrh softens the florals, making it a light floral I would love to anoint myself with – without being offensive to the olfactory senses of others. Dry: It has become very rosy now, dwarfing all the other florals and while only letting the impression of myrrh out under it’s weight. Other Impressions: As it settles even more, the lily starts to push its way in. The floral aspect has gone from light to strong as it dries. Perhaps I wouldn’t apply it so liberally. So far, scents from this line from BPAL have been hit or miss. Either I love them and covet a bottle, or the scent goes straight into the swap pile. Let’s see where this one ends up. Oil Color: Clear, although against a while paper, there is just the slightest hint of faint yellow color. Bottle Design and Artwork: This is a standard vial / imp size (1/32 oz). The label wrapped around the bottle features an Art-Deco inspired Phoenix with the the name of the company at the bottle of the image. On the other side, the title of the scent written in large, clear black font outlined with red on the front. In the Imp (ITI): Ok, it reminds me of the old plug in Glade scents. I think it is the lilt of the valley as this floral aspect is a bit too strong for me. It certainly wakes me up though. On second sniff, there is some sweetness from the pear and the musk. I do hope those take over once on my skin. Wet: Still too overly floral and chemically with the lily of the valley, but the pear comes more the the forefront, as is the musk. If the lily of the valley can diminish completely, I may actually like this scent. Otherwise, it’s very floral, very feminine, but just not me. Dry: 30 minutes dry, the lily of the valley is now behaving itself and it allows the rose and the pear to come out and play. At this point, all the notes are balanced. It’s pretty, but the floral is making it go just a tad soapy on me. Other Impressions: It smells like generic hand-soap according to my husband.